Hello there, Crafty Blog Stalker Readers! I’m so happy to be hanging out here today. I’m Emily from That’s What I Eat, where I talk about my experience losing 70 pounds by cutting out (most) processed foods, and share tips and tricks to help other people to do the same. Today I’m excited to share with you one of my favorite new tricks. Did you know you can get massive amounts of delicious nutrition on the cheap by growing your own sprouts? 1. Buy a bag of dry, uncooked lentils . These are located by the dry beans in the grocery store, and should cost about $1.00 to $2.00. Super cheap, and this one bag is going to last you a long time! There are lots of other beans and seeds you can use, too, but lentils are always easy to find and super cheap, so that’s usually my go-to. Don’t use pinto beans, they tend to get slimy and gross long before anything sprouts. 2. Fill a mason jar 1/4 to 1/3 full with the lentils. These guys are going to expand and then grow a lot, you want to leave them lots of room! I like to use a pint-sized mason jar for this. 3. Cover the lentils with water, giving them plenty of room to expand. I like to give an extra inch or two of water, it’s better to have too much than not enough! 4. Stash your lentils in a safe spot to soak. They like to hang out in the water for about 8 hours, so I do this right before bed. My kitchen windowsill is the perfect place for this. 5. The next morning (or about 8 hours later), dump the water out. You could get all fancy and put cheesecloth over the top of the jar and screw the lid on, but I am not fancy. I just hold my hand on the side to let out the water and don’t sweat the few lentils that jump ship. After the water is gone, put it in a safe place with indirect sunlight. 6. Every 12 hours or so, fill the jar with water, swirl the lentils around, then dump the water back out. I usually do this at breakfast and right after dinner when I’m standing at my kitchen sink anyway. After just a day or two you will see roots start to grow. 7. After about 5 to 7 days, your sprouts will have green tips reaching for the sun, and the jar will be full of delicious sprouts. 8. Remove from jar and store in the fridge. I like to put in a zip top bag with a folded paper towel inside, but you can use any container you wish. The paper towel seems to keep them fresh longer. These sprouts will last about a week. 9. Eat them! What is the best way to eat sprouts? It’s way too hard to decide on just one! I love to throw sprouts on salads, or in yummy veggie wraps. for breakfast. I even will sometimes find my kids snacking on them right out of the bag. It doesn’t get better than that! 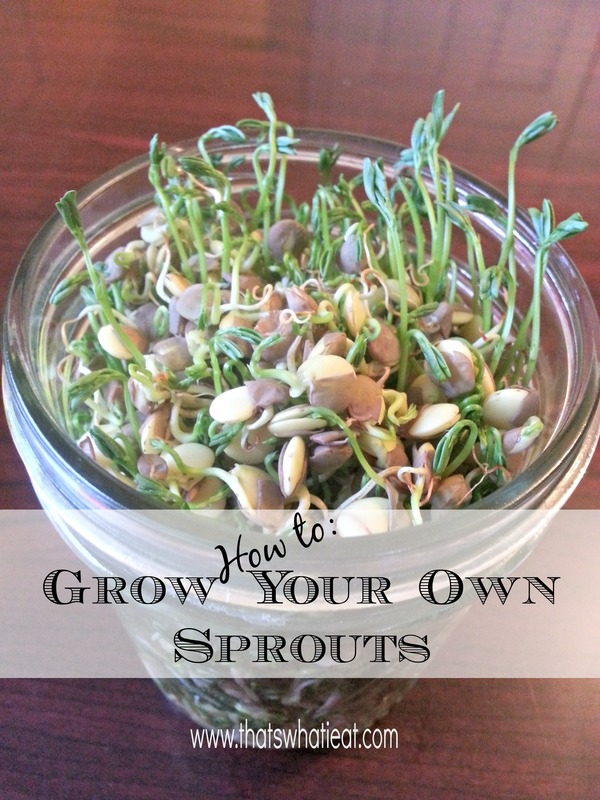 Have you ever tried growing your own sprouts? What is your favorite way to eat them? Emily Allen is a mom to three beautiful girls. She discovered her passion for health and nutrition as she went through her own transformation, losing 70 pounds through the power of diet and exercise. She is now dedicated to sharing that passion with others, beginning with her blog at www.thatswhatieat.com. She studies at the Institute of Integrative Nutrition, studying over 100 different dietary theories from the top names in health and nutrition. You can follow Emily on Instagram or Pinterest. What a fabulous idea! I love the idea of growing your own… thanks for sharing! I can’t wait to try this! I think my kids will enjoy seeing the lentils sprout, too! Thank you for the excellent instruction. Thanks for the step by step. Makes me feel confident enough to try!